Accumulation of uneaten feed and debris during culture of shrimps and fishes could result in release of organic matter that settle in the bottom and result in release of toxic gases like ammonia, nitrite, nitrate and sulphides. The release of carbon dioxide would result in generation of odour in the ponds. 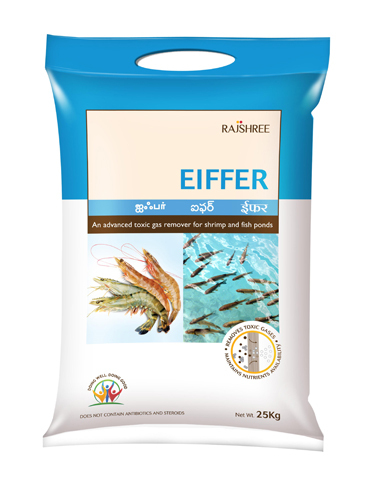 Eiffer consists of oxides of silica, aluminium, iron, calcium and magnesium and is an advanced toxic gas remover that could eliminate toxic gases and prevent odour formation there by helps maintain healthy pond bottom.